This is a limited edition vinyl boxset of Blancmange’s first three albums – Happy Families (1982), Mange Tout (1984) and Believe You Me (1985). Each release includes the original album (remastered), plus B-sides, extended versions, remixes, previously unreleased tracks and demos. Happy Families, released in 1982, feels like a fully-formed electronic pop classic. Highlights include ‘Living On The Ceiling’ (a striking #7 hit in ’82 thanks to its mix of electronics with tabla and sitar), the melancholia of ‘Waves’, ‘Feel Me’s call-and-response electro-funk, the intense ‘I Can’t Explain’ and ‘God’s Kitchen’ which is an early example of Neil Arthur’s gift with images and wordplay. 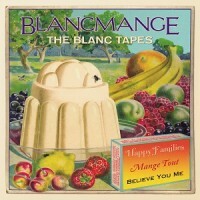 Blancmange’s second album, Mange Tout reached # 8 in the UK charts in 1984 and spawned more hits – notably ‘Blind Vision’ (#10), ‘Don’t Tell Me’ (#8) and their fantastic cover of ABBA’s ‘The Day Before You Came’ (much loved by ABBA who let them use footage from their original video for the Blancmange promo). It signals another change for the band’s music, now increasingly built around deep, propulsive dance grooves.